We’ve gotten word that inside Apple there are Apple TVs running the Hulu Plus app natively. The app is feature complete and ready to roll out to Apple TV users on current builds. In fact, it has been ready for at least a month and development is now on hold. While there are no technical issues standing in the way of the Hulu Plus release on Apple TV, there appear to be some political ones. At some level at Apple, there appears to be some consideration that the Hulu Plus app could eat into iTunes TV sales on the Apple TV. Where Netflix tends to run older programming, iTunes is the Apple TV’s only outlet for current TV programming. Hulu Plus is available on the iPad and other iOS devices but unlike many other content apps, you can’t AirPlay them to an Apple TV like Apple’s own iTunes videos. Additionally, you can use an HDMI cable to watch the iOS Hulu Plus through an iPad on your HDTV, but mysteriously only in Standard definition, not the native HD Hulu or iTunes quality. Plus, who needs an HDMI-tethered solution? Adding to the political troubles, Hulu was recently trying to sell itself to players including Apple competitor Google (and Apple itself) but no bidders were willing to bid high enough. Perhaps Apple wanted to make sure that Hulu Plus didn’t turn into a Trojan Horse for one of its competitors? 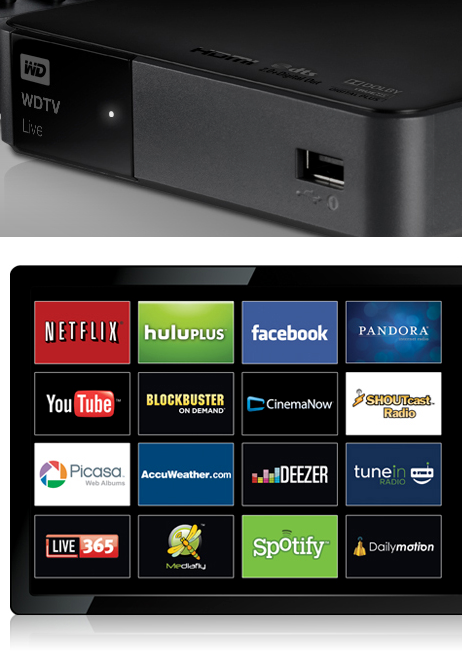 Hulu Plus was originally barred from all TV platforms, but giving hope to Apple TV users, it recently appeared in HD on the $59 Roku (above) and even a few smaller platforms like the very capable Western Digital’s TV Live (pictured below).